With its plush chenille upholstery, this London chenille collection will add a distinguished look to your living room. Entertaining, relaxing, and everything in between has never been so nice than with the London chenille collection. Beautiful chenille fabric which will provide you with both comfort and style. 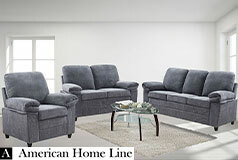 While both soft and cozy, its chenille fabric makes this collection durable. This collection comes in a gorgeous neutral grey colour that goes with anything and everything! Key Features: Chenille looks and feels velvety soft for a sumptuous appearance. Get comfortable on the easy-to-maintain, grey-coloured upholstery fabric. High-performance, furniture-grade woods provide exceptional durability, stability and strength. Plywood is used for its resistance to cracking, shrinking and warping, while providing extra strength to furniture structures. Chenille fabric is both beautiful and soft, adding a rich look to your decor. The look of chenille will change from one angle to another as the woven fibres catch light differently. Commonly manufactured from polypropylene, cotton, and polyester, this fabric is durable and easy to maintain. Dimensions: Chair: 41.3" x 33.5" x 40"